WELCOME TO DECEMBER « THE BRYCE IS RIGHT! – Tis the season for “Bah” and Humbug”! 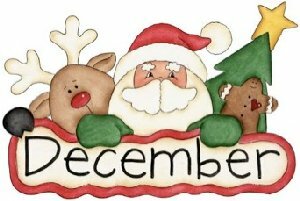 There’s only one other month I dislike more than July, and that is the month of December. During July, people in my neck of the woods evacuate in record numbers, leaving a ghost town behind. December though seems just plain “lost” to me, meaning not much is accomplished as the schools shut down and people scurry out of town on vacation or to celebrate the holidays elsewhere. Following Thanksgiving, the corporate world also seems to shut down until the new year. People try to use up their vacation days, a plethora of company parties are planned, small companies shut down, and voice mail seems to run everything. From a business perspective, Internet traffic drops off noticeably (except for spam), telephone calls diminish, and for all intents and purposes snail mail disappears completely. It’s like the country goes into a state of hibernation. The only exception to this is sales as companies are desperately trying to spend money before the end of the year as opposed to turning it over to the government in the form of taxes. Aside from this, the December slow down is a good month to close up the operating year and make plans for the next one. As a kid, I enjoyed December as it represented the Christmas holidays and toys. I’ve long outgrown that though, and am very much turned off by the commercialization of the holidays. The idea of decorating the house inside and out, sending out holiday cards which nobody reads, scurrying around to buy presents which will ultimately be returned is loathsome to me. Then there is the matter of pitiful television programming whereby we watch shows like “Frosty the Snowman” for the millionth time or sitcoms wishing everyone politically correct tidings of the season, even though they were recorded last April. Maybe I should just declare December “cruise month” and be done with the holidays once and for all. Company parties this time of year are always entertaining, particularly when you see a drunken employee telling off the boss. Excuse me, I meant a soon-to-be-fired drunken employee. In the business world, an employee’s upwards mobility in the corporate hierarchy can be greatly enhanced by producing a good holiday party. You may remember me describing the efforts of a friend who was put in charge of an IBM Christmas party years ago in Poughkeepsie. Employee families were invited to attend, including the children of course. It was a very big affair. Every child in attendance was given a good present by Santa (not something cheap), everyone fed on a sumptuous meal, there was plenty of libations, music and entertainment, and all within budget. My friend, even had enough money left over to make a respectable donation to a charity on behalf of the company. And, Yes, a photographer was on hand to take everyone’s picture. The company party ultimately catapulted my friend’s career at IBM where he served for many years. December is also when we generally “pork up” on all the goodies baked and cooked this time of year. If we go to holiday parties, we tend to overeat, over indulge, and pledge to turn over a new leaf in the new year, which we seldom do. It’s particularly difficult for people living in the snowy north who are stuck inside and come down with a touch of Cabin Fever. At least down here in Florida, we can sneak outside and do some lawn work or visit the beach. I generally keep a low profile during the month of December in order to avoid the madness and not add to it. Others may enjoy the fanfare of the holidays, I try to stay out of the limelight and quietly go about my business. It’s not that I am avoiding my faith, certainly I am not. I just find it is something rather personal. I’m not sure why we make a big deal out of December. Maybe it’s because of our religious faith, or maybe it represents the end of a calendar year which was either good or bad (if the latter, please do not call me). People seem to have forgotten that December was invented in 1929 as a means to comfort those hurt during the stock market crash in October. Prior to this, there was only eleven months. Following Thanksgiving, we went straight into the new year. Retailers learned to capitalize this time of the year by unloading the shoddy merchandise they bought too much of during the year. Whatever the reason, good luck this month and what’s a good number for a cruise line? NEXT UP: POLITICAL POSTMORTEM, 2012 – What we learned following the election and what we will do about it. This entry was posted on December 3, 2012 at 5:54 am	and is filed under Life. Tagged: Florida, palm harbor, The Bryce is Right, tim bryce, WELCOME TO DECEMBER. You can follow any responses to this entry through the RSS 2.0 feed. You can leave a response, or trackback from your own site. I do agree about the commercialization and have almost eliminated the Christmas cards, but, the decorations make the house look so cozy and warm, (Canada, here), and the outside lights definitely brighten up an otherwise dismal winter. My German heritage fuels my enjoyment of the season, as traditions play a large part. Love my “Tannenbaum”. P.S. Right on U.V. of Largo, Florida! This political correctness crap is ridiculous! “Just an FYI … when I was in the military, basically we went on “relaxed” routine right after Thanksgiving, and “holiday routine” probably a little before Christmas until just after New Years. Now, obviously, we had to be prepared for contingencies, but when you’re on duty in DC, there’s not a lot of seriously important stuff going on during that period of time. “December is probably the happiest, busiest month for those who have young children or grandchildren nearby. For empty nesters whose kids have flown to some distance, the idea of a holiday cruise sounds pretty appealing. Those activities that were fun with kids just aren’t the same when you’re doing them alone and no one is coming for the holidays. “It is all a matter of perspective. Sure the hustle is heavy in the spirit of trying to out do each other in the giving of gifts (few truly remember why we do this) And I do agree the sale pitches intensify. I think about the kids and folks that have come to my shop and I have been able to help them fix something or give some advice that taught them about model airplanes or life. In December, the year is almost over is for me a time of reflection and study. I wonder how I can help more folks next year and still accomplish my goals. I stop to consider why we celebrate this time of year and who brought it upon us. Although the origins of Christmas may be falling by the wayside, I remember why we celebrate it. LOL, and I don’t mind the lines in the stores as I am in a power wheelchair and never have to STAND in line. It also is a treat for me to watch the folks shopping for Christmas. Some just grab an item off the shelf and throw it in a basket, and other take many minutes deciding if this is just the right present for that special someone. And for the most part, I believe December and Christmas bring out the good in people.